Eliminate excess dust, mold, and an unpleasant musty smell with the Portable Dehumidifier by hOmeLabs. This easy-to-use dehumidifier is the perfect choice for large rooms in both home and work environments. The Portable Dehumidifier by hOmeLabs removes odors, allergens, and excess moisture from rooms up to 4,000 square feet. For people with allergies and upper respiratory problems, including asthma, the Portable Dehumidifier by hOmeLabs is ideal. It is also perfect for anyone with a compromised immune system who needs protection from bacteria, as well as those living or working in an environment with a musty smell. By eliminating odors and allergens, the air quality improves dramatically. Especially for basements and other large spaces up to 4,000 square feet, this dehumidifier gets the job done. Quickly and effectively, it eliminates foul odors and bacteria. The only downfall, even with handles and wheels, is that at 40 pounds, it might be somewhat tricky for some people to move from one location to another. Powerful Operation – This 9-gallon large dehumidifier removes as much as 72 pints of moisture from the air daily. With its incredible suction power, the Portable Dehumidifier by hOmeLabs is hard to beat for basements, cellars, and a host of other large spaces. Even though this monster machine has a lot of power, it is Energy Star certified. That means it eliminates excess moisture, odors, and allergens without having much effect on your energy bill. Modern Design – Instead of having an unsightly design, this dehumidifier is sleek. As a result, it fits in beautifully with any modern décor. With built-in handles and wheels, most people can move it easily, and thanks to an extremely quiet fan, it does not overpower conversations or sound coming from the television or stereo system. 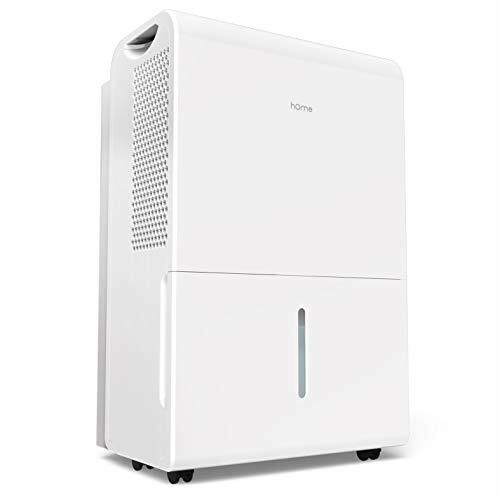 Ease of Use – A significant advantage of using the Portable Dehumidifier by hOmeLabs compared to other units is its streamlined design for easy use. Simply select the preferred moisture setting and then let the unit run a continuous 24-hour cycle. Once the tank fills, the dehumidifier shuts off automatically for optimum safety. With a drain hose outlet, the unit continuously drains. However, this dehumidifier does not come with a drain hose. The best option is a 5/8-inch hose that has a female threaded end. To prevent any leakages, the manufacturer suggests using Teflon tape. Excess Moisture – For a problem with excess moisture, which wreaks havoc on wood furniture and furnishings, this dehumidifier comes highly recommended. Thanks to its built-in pump compressor, it also takes care of unwanted odors and allergens found in humid air. By switching the normal fan speed to turbo mode, the dehumidifier increases the volume of moisture removed and odors reduced. Important Factors – When operating the Portable Dehumidifier by hOmeLabs, there are a few essential factors to consider. First, dehumidifiers absorb moisture by emitting heat. For that reason, you cannot use this product when operating an evaporator cooler in the same room. Second, this unit works incredibly well for large spaces of between 2,500 and 4,000 square feet. Third, the 1.6-gallon tank can remove as much as 9 gallons or 72 pints of moisture daily. Using the Portable Dehumidifier by hOmeLabs is a breeze. Just turn the power switch on and allow it to run a continuous 24-hour cycle. For optimal safety, the unit shuts off automatically once the tank fills. In rooms with severe moisture, odors, or allergens, or when you want faster results, you can choose the turbo mode over the normal fan speed. Once the tank fills completely, remove it, dump it, and replace it for the next use. 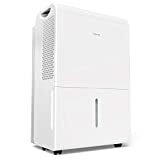 Although the Portable Dehumidifier by hOmeLabs is an excellent choice, if you want something slightly smaller, consider the Frigidaire FAD504DWD 50-pint dehumidifier. This unit is also Energy Star certified. For removing allergens, odors, and excess moisture, it offers continuous 24-hour operation with an alert system that shuts the unit off automatically when the tank fills. It also eliminates unpleasant mildew odor caused by moisture, plus it operates on 24-hour cycles without affecting your energy bill. Creates healthier environments for people with allergens, asthma, and other upper respiratory conditions. With the Portable Humidifier by hOmeLabs, you can enjoy your home or work environment more.